JWitsml is a library for accessing WITSML servers. 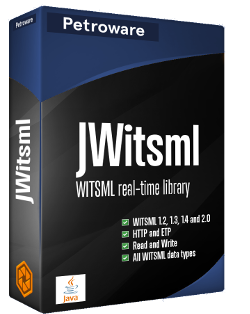 The goal of the JWitsml project is to support WITSML client software with WITSML data through a clean, complete, well documented, efficient and extremely simple to use Java programming interface. 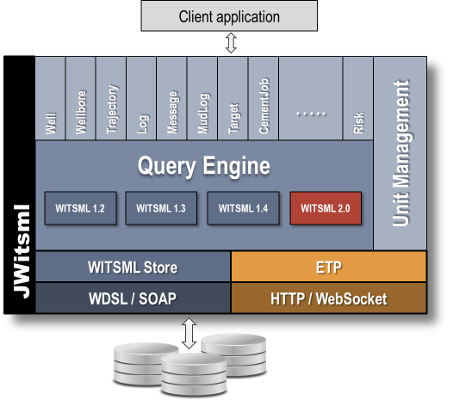 JWitsml supports both the WebSocket/ETP transfer protocol and the older HTTP/SOAP protocol. There exists many tools for browsing WITSML data, but in order to get hold of the actual data for performing advanced computations or create custom applications, a library like JWitsml is required. Populating WITSML servers with log data converted from LAS, LIS, DLIS, BIT, CSV, Excel etc. Wellsite information transfer standard markup language (WITSML) is an open standard for defining and transmitting technical drilling data between disparate systems and companies in the E&P petroleum industry. WITSML is a technology which allows previously incompatible or proprietary systems to interoperate and share data. The WITSML standard is being developed and maintained by Energistics, a non-profit consortium designed to develop and deploy open data exchange standards in the oil and gas industry. Energistics Transfer Protocol (ETP) is a data exchange specification that enables the efficient transfer of data between applications and systems. It defines a data streaming mechanism so that data receivers do not have to poll for data and can receive new data as soon as it is available from a data provider. ETP is defined as about 50 distinct messages that can run asynchronously between a client and a server, all implemented on top of the WebSocket protocol. Messages are serialized over the connection using the Apache Avro standard. Model data is delivered as a combination of XML and compressed bulk data according to the DEFLATE (GZip) standard. ETP is the transportation protocol of the EnergyML standards from Energistics. ETP can deliver both WITSML 1. * and WITSML 2.0. Shows how JWitsml is used in Log Studio to upload well log content from various sources to WITSML with single button clicks.